Why Should EIFS Be Inspected? If those conditions did not exist, typically there would be no water intrusion. The five-phase inspections will be performed at the completion of the Substrate installation, at the end of the waterproofing application, at the conclusion of the Insulation Board (polystyrene) installation, at the completion of the Base Coat installation, and at the completion of the Finish Coat installation. These inspections are needed to provide a level of quality control for general contractors, municipal code officials, and property owners for peace of mind concerning the proper installation of the EIFS siding on their properties. – Horizontal Joint at Floor Lines; the horizontal joints addresses the cross-grain shrinkage in dimensional lumber that could result in wrinkling or cracking of coatings, or bulging of the system which occurs when lumber experiences its initial loss of moisture. – Sealant Joints around Openings and Penetrations; the sealant is installed to provide a weather seal and to accommodate movement between materials. Its utilization is essential at all terminations, including where EIFS terminate or meet other materials. Therefore, it Prevents water entry where EIFS meet other materials like around windows, doors and other minor penetrations in single-family houses. – Projecting Surfaces; location and climate will influence the performance of a projecting surface. Trimming around horizontally protruding windows and doors, quoins, and other decorative features that are is acceptable if no damage has occurred to the EIFS surface. – Termination above Roof or Deck; a gap allows for appropriate system edge termination, ease of roof or deck replacement or repair. It also provides for the system and flashing to be inspected for proper installation. – Completion above Finished Grade; maintain a gap between EIFS and the finished grade. The gap must be wide enough to allow access for visual inspection and treatment of the foundation for pest control. – Kick out/Diverter at Roof/ Wall Intersection; accumulating water runoff should be directed out and away from the structure. Roof-to-wall flashing requires a kick out/. 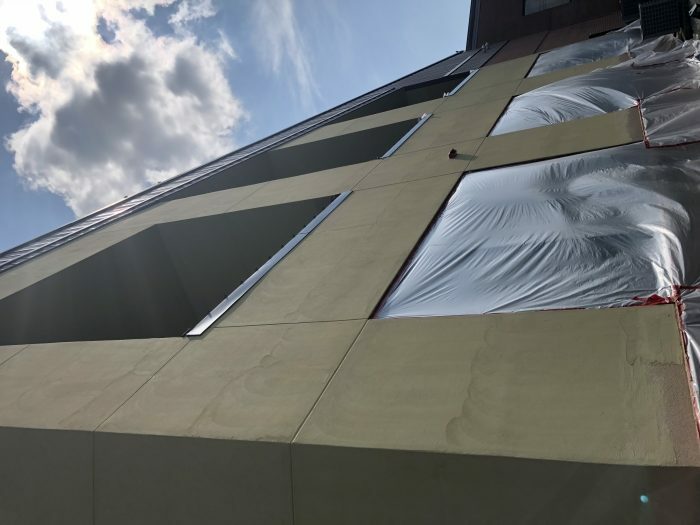 Some EIFS manufacturers require a third-party inspection of the EIFS installation as a warranty requirement diverter at its termination to ensure that the direction of water to the outside. We have well-trained certified inspectors, who have completed extensive training through the Exterior Design Institute (EDI). Our inspectors are knowledgeable in the installation details of all brands and styles of EIFS, one coat stucco, and traditional hard coat stucco systems maintaining their certification and training on an annual basis. As always, we will provide a comprehensive report after each inspection pointing out installation flaws and moisture readings in affected areas. Not only is the proper installation of EIFS key, but proper routine maintenance is also critical. Having an existing EIFS property periodically inspected for failure or the breakdown of its components is a must. Because many times the symptoms of failures in the installation of EIFS are not visible, it is essential to have an EIFS home adequately inspected by a well-trained inspector. If you own an EIFS property, don’t panic. Have your routine property inspection for failures, and the results of failures, in the EIFS components. If you plan to sell or buy an EIFS home or property, get it inspected before putting it on the market or purchasing it respectively.